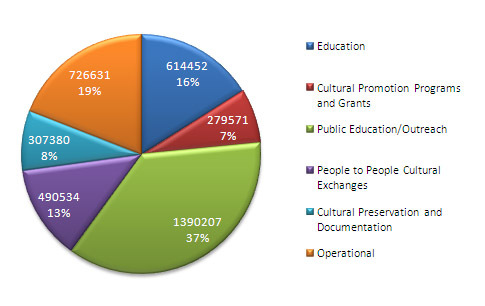 In 2008, the Turkish Cultural Foundation allocated a total of $ 3.808.775 in grants and direct disbursements to pursue its mission. For a listing of all Foundation grants please visit our grants page. The Turkish Cultural Foundation continued offering its “Turkish community schools” grants in 2008 and assisted the founding or expansion of five schools to serve children of the Turkish American community. Grants for this project were awarded to the Turkish-American Association of Arizona, the American Turkish Association of North Carolina, the Ventura County Turkish American Association, the Turkish American Cultural Association of Michigan and the Florida Turkish American Association. The Turkish American Women’s Scholarship Fund, an organization supporting college education for underprivileged young women in Turkey, received a scholarship grant from the Turkish Cultural Foundation to support 10 college female students, who study humanities in Turkey. 2008 saw the inauguration of the Turkish Cultural Foundation Fellowship Program in Culture and Art. Through this program, the Turkish Cultural Foundation expanded its support in education to post-graduate studies. The program aims to provide support to students, researchers and scholars who conduct research and publish on the art and culture of Turkey, with a special emphasis on studies related to the preservation of Turkey’s artistic and cultural heritage. The mission of the Turkish Cultural Foundation Fellowship Program is to recognize and assist scholars, whose academic achievements and research reflect the commitment of the Turkish Cultural Foundation to disseminating knowledge about Turkey’s cultural heritage. In 2008, 6 post-doctorate and 4 Ph.D. dissertation fellowships were awarded. Promoting Turkish culture in the United States through partnerships with other organizations has continued to be an important mission for the Turkish Cultural Foundation in 2008. The Turkish Cultural Foundation underwrote as primary sponsor leading Turkish cultural festivals in the United States in 2008, namely in New York, Boston, Dallas, Washington, DC, Houston, Monterey, Chicago and Seattle. Supporting the promotion of Turkish cinema in the United States remained on the cultural agenda of the Turkish Cultural Foundation, and through its partnership with the Moon and Stars Project, acclaimed Turkish films were screened at a variety of Turkish film festivals around the United States including New York, Madison, Seattle, Ithaca. The Turkish Cultural Foundation also provided support to promoting Turkic culture in the United States through a grant to Houston Azerbaijanis, a group celebrating Azerbaijani culture in the United States. Additionally, the Turkish Cultural Foundation sponsored Turkish cultural celebrations at the University of Pennsylvania Museum and the Philadelphia Museum of Fine Art. The Turkish Cultural Foundation was a sponsor of the Biennial Conference of the Historians of Islamic Art of America, and gave a grant for a Turkish culture event to the Middle East Institute in Washington, DC. A grant to the Pittsburgh Turkish American Association enabled a group of American children to participate for the first time in many years, in the International Children’s Day celebrations in Turkey. In light of the Turkish Cultural Foundation’s mission to preserve disappearing art forms, and a salute to a master project completed by the Foundation on the Turkish theatrical tradition of Karagoz plays (see below), the Turkish Cultural Foundation was pleased to support the Turkish American Art Society of New York in the Broadway performance of the Karagoz-inspired Kanli Nigar play. To encourage artistic excellence, the Turkish Cultural Foundation provided a grant for the 1st International Print Biennial Awards Istanbul 2008 at Isik University. (photo1, photo2) To aid Turkish professionals working in the arts’ domains, the Turkish Cultural Foundation supported a Turkish gallery, Golcuk Art Gallery’s participation in leadership conference at Santa Clara University. To further the Turkish Cultural Foundation’s goal of showcasing Turkish artists for international audiences, the Turkish Cultural Foundation provided funds for Turkish painter Gizem Saka to participate in the NY Art Fair and facilitated the participation of Turkish Harpist, Sirin Pancaroglu in the World Harp Festival. A grant was also provided to Ms. Arzu Mammadova to attend a symposium on Turkish culture in Kazan, Tatarstan. The Turkish Cultural Foundation continues to expand and improve its award-winning websites. Our efforts to promote Turkish culture worldwide continued with the completion of the English version of the Turkish Cuisine Portal. In 2008, the Turkish Music Portal received the Golden Spider 2007 Award. (photo1, photo2) Efforts to improve and expand the Turkish Culture Portal, which remains the most visited website on Turkish culture on the internet, have also continued. This year, we added a "Who’s Who" online database of living artists, artisans and scholars in Turkish art and culture to our Turkish Culture Portal. This online database aims to help promoting Turkish artists to the world, while making it easy for people of common cultural interests to find each other and collaborate on projects that celebrate Turkish cultural heritage. The Turkish Cultural Foundation continued its activities in the area of public education and supported similar efforts of like-minded organizations. Other public educational programs were initiated in collaboration with the World Affairs Councils of America (WACA) on a nation-wide scale with the cooperation of 21 local World Affairs Council chapters in 2008. In its second year, this collaboration created a nationwide educational outreach program focusing on teacher education on Turkey, as well as program on Turkey for the general public with the aim to enhance general understanding about Turkish society, culture and history. Under this program, participating 21 World Affairs Councils around the United States organized teachers workshops on Turkey, collaborated with the Foundation in selecting teachers for the teachers study tours to Turkey (see below) and organized a series of public educational programs titled “Portraits of Turkey”. Since the beginning of this TCF-WACA collaborative program in 2007, approximately 1400 teachers participated in the educational workshop, while the public programs on Turkey reached nearly 2000 Americans. In line with its mission to promote Turkey’s historical and cultural heritage, the Turkish Cultural Foundation provided two major grants in 2008 to documentary film projects. Produced by Kell Kearns and Cynthia Lukas, Rumi Returning tells the life and philosophy of this great Anatolian mystic and poet, and Turkey’s legacy as a cradle of different religions and philosophy. In 2008, the Turkish Cultural Foundation supported the completion of a documentary by Victoria Barrett, Shenandoah Films’, who produced and directed the documentary "Journey of Faith..on the Trail of Christianity in Turkey". The film is a stunning visual documentary of Turkey, centering around the early Christian heritage of Anatolia. Rumi Returning has already been shown on dozens of PBS stations and Journey of Faith made its premier of West Virginia PBS. In response to demand for programs on Rumi, the Turkish Cultural Foundation provided a grant for a research and documentary project about Rumi to the Philadelphia Society for Art, Literature and Music. Providing support to Turkish American community-based media with a goal to increase communication in the Turkish American community and promote Turkey, the Turkish Cultural Foundation supported the “Turkish American Hour" on Fairfax Public Access channel and “Bonbon”, a magazine for Turkish American children produced in Washington, DC. The Turkish Cultural Foundation also provided grants to the American Turkish Association of Washington, DC. and the Istanbul University Alumni Association in New York in support of their public educational programs. Since the inception of this program area in 2006, the Turkish Cultural Foundation has introduced over 200 Americans to Turkey through its cultural tours and teachers study tours. To enhance relations between Turkish and American museums, the Turkish Cultural Foundation underwrote lectures and workshops and sponsored visits by museum administrators and curators. Dr. Sid Goldstein, curator of the St. Louis Art Museum giving gave a lecture to staff from various Turkish museums at the Turkish Cultural Foundation’s Istanbul Office. Dr. Halil Demirdelen, Turkish staff member and scholar at the Museum of Anatolian Civilization (Ankara), was sponsored by the Turkish Cultural Foundation to do a fellowship at the University of Pennsylvania Museum. Spearheading and supporting projects to preserve the cultural heritage of Turkey is one of the pillars of the Turkish Cultural Foundation. The Turkish Cultural Foundation served this mission by continuing to support scientific research and documentation about the civilizations of Anatolia and Turkey’s archeological, architectural and artistic heritage through projects realized in 2008. The Seljuk Era Cultural and Architectural Sites Inventory/Database Project undertaken by the Foundation for the Advancement of Turkish Cultural Awareness, a Turkish non-governmental organization, received continued support from the Turkish Cultural Foundation as a multi-year integrated research project. Collaborating with the Global Heritage Fund, the Turkish Cultural Foundation became a sponsor of the excavation and preservation project at the ancient archeological site of Catalhoyuk, a Neolithic site in Central Turkey, which is home to the world’s earliest mural art and is central to the origin of civilizations dating back some 9000 years. The Turkish Cultural Foundation funded publication of a series of educational books (16 volumes) about Anatolian Civilizations, titled “Anatolia Before You”, prepared by the Museum of Anatolian Civilization (Ankara). This half-finished series was available only in Turkish and the Turkish Cultural Foundation’s grant enabled its completion through the Turkish Republic period, as well as the English translation and publication of the entire volume. This children’s books series is available now at the Museum and will help introduce Anatolian life through the different ages to children. It is “narrated” by a fictive child from each period and explains the environment, animals, family, food, clothing, culture and general lifestyle of each civilization found in Anatolia. In 2008, the Turkish Cultural Foundation completed a 2-year project culminating in the release of “Turkish Traditional Shadow Theatre: Karagöz”. Funded and produced by the Turkish Cultural Foundation, this DVD collection of 20 Karagoz shadow puppet theater plays were professionally performed, filmed and recorded by the Turkish Cultural Foundation. Master puppeteer Metin Ozlen, an assistant puppeteer and musicians performed the plays in the traditional style using shadow puppets handcrafted by Metin Ozlen. (photo1, photo2) The DVDs are accompanied by a booklet in Turkish and English with a detailed introduction to Karagoz by cultural historian Metin And, who sadly passed away soon after the completion of this project. The booklet also features a synopsis of the plot of each play, while the film includes plot summary subtitles in English for each play and behind the scenes shots of the puppeteers preparing and manipulating the puppets. This project encapsulates the dedication of the Turkish Cultural Foundation to the preservation and dissemination of the cultural wealth of Turkey. The collection has earned accolades in Turkey and abroad and was featured at the international art exhibition, In Praise of Shadows, presented at the Museum of Modern Arts, Dublin, Ireland (photo1, photo2, photo3), the Benaki Museum in Athens, Greece, and the Istanbul Modern Museum in Istanbul, Turkey (photo1, photo2, photo3) (news coverage). As the Turkish Cultural Foundation’s Turkish Music Portal illustrates, one of Turkey’s greatest riches is its musical heritage. In 2008, the Turkish Cultural Foundation continued providing grants for one of the oldest musical societies in Istanbul, the Eyup Music Foundation, to expand their facilities to teach young children and adults Turkish classical music in this lower income neighborhood of Eyup in historical Istanbul (photo1, photo2, photo3, photo4). Additional support for research and documentation on Turkish music was provided by the Foundation for a multi-discipline field research project and material collection led by Turkish ethnomusicologist Dr. Melih Duygulu, coordinator of the Turkish Music Portal project, with a view to produce a Turkish Folk Music Dictionary. The Turkish Cultural Foundation operates offices in Boston, Washington, DC and Istanbul with a growing staff, as well as interns and volunteers, implementing the mission and undertaking the international work of the Turkish Cultural Foundation.